Internship – The quality of the internship and work can be a very decisive turning point in one’s life and career, many outcomes can come out if this which feeds into many of the other areas. There can be a big difference between an internship and an ordinary job at undergraduate level, the difference between one leading to character development and the other just a means to pay bills. 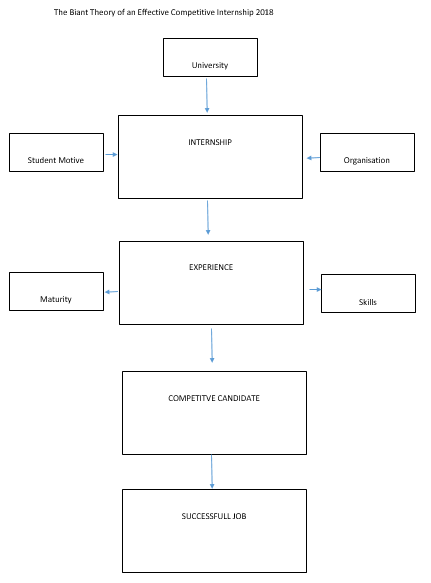 The student motive, support of the university and a meaningful work experience from the organisation all contribute to the success of the internship. University – the university has a big part play with graduate competitiveness. The reputation of the institution, their standing within the business community and social community have a large bearing. The support and nurture and opportunities they provide to students such as internships and career connection can much to the competitiveness to a graduate. Student Motive – the motive and attitude of the student undertaking the internship will have a big factor in the success of the outcomes of the internship. If the student is forced to do an internship or has no motivation like being given credits or payment or the view to get experience then the internship will not be as valuable to the student as could potentially have been. Organisation – the host company has a big part to play in the success of the internship, in terms of mentoring, training and giving meaningful work to undertake. Feed-back and development are important to the student for the success of their internship and value to the organisation. Experience – experience covers a multitude of areas, but genuine work and industry experience helps to create the confidence in interviews and working environment as well as a differential advantage to add onto your CV with credible relevant work experience. 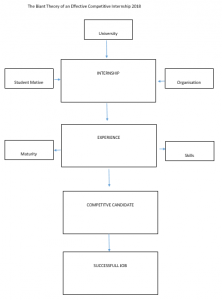 A structured internship will develop a different kind of experience than just a part time job. The experience will lead to maturity and useful commercial skills that can be transferred into employment. Soft skills/Life skills – many employers are looking for soft skill capabilities even more so than technical skills, the more soft skills a student can develop and demonstrate the more valuable and attractive they become to an employer. Employers are also always looking for those candidates that have the ability to think through problems and have withal about them. The ability to know and understand technical skills is an added bonus when applying for a job that requires a technical part to the role. Competitive Advantage – A successful internship leading to experience, maturity and skills will give the student a competitive edge when applying for jobs if not offered one with the original host company. Leading to a successful job. I must express some thanks to the writer just for rescuing me from this situation. As a result of searching throughout the world-wide-web and getting techniques that were not pleasant, I was thinking my entire life was well over. Living minus the answers to the issues you’ve sorted out by way of your entire posting is a crucial case, and those that would have in a negative way damaged my career if I had not encountered your blog. That ability and kindness in handling a lot of stuff was invaluable. I am not sure what I would have done if I hadn’t discovered such a solution like this. I’m able to now relish my future. Thanks a lot very much for this reliable and amazing guide. I won’t be reluctant to recommend your web blog to anyone who requires guidelines on this subject matter. impressed! Very helpful info specifically the remaining part 🙂 I maintain such information a lot.